This city is the capital of India itself. The typical landscape of the capital is indeed very dense and has its own attraction where the hustle and bustle of vehicles takes place every day. This situation is at the same time a characteristic of this country, especially in New Delhi which is the capital of India. What makes it interesting is that heavy traffic accompanied by horns that are mutually interconnected seems not to be a sign of traffic jams, but the flow of traffic that runs precisely smoothly even though it is a bit irregular. With a population of more than 10 million people, New Delhi remains a charming city for you to stop by with its unique culture and historical heritage. Although the traffic is not organized neatly in various modern countries such as Germany, America, Britain and other countries, but in terms of transportation, it seems that New Delhi is not outdated. Gate India is the first tourist spot that can be visited if you come to New Delhi in India. Indian Gate is one of the monuments in India. The location of this national monument is right in the center of New Delhi, India which is the capital of India itself, precisely at the western end of Rajhpat and connected to the Rashtrapati Bhavan or Indian Presidential Palace which is only 2 km east of the Gate of India. This national monument was originally known as the All India War Remembrance Gate, where the monument was designed by Sir Edwin Lutyens. This national monument was intentionally built to commemorate as many as 90,000 Indian-British soldiers who died on the battlefield. As we know that in World War I, India was occupied by the British Empire and also the third Anglo-Afghan war. The monument is made of red brick with a combination of granite stone. After India achieved its independence, India Gate became the tomb site of the Indian army and was known as The Flame of The Immortal Soldier. One more thing that can be enjoyed at this national monument is its beautiful and beautiful garden with a little decoration resembling a pond. In addition, the Rajhpat road which is the road from India Gate is an important road in India that is used as a place for parades on Republic Day which is commemorated every January 26th. Qutub Minar is the second tourist spot that can be visited when you come to New Delhi, India. Qutub Minar is the highest brick tower in India. This tower is a legacy from Qutb-ud-din Aibak, namely the first Muslim ruler in Delhi. Qutub Minar itself was built in 1193 and recorded as a World Heritage Site by UNESCO with qutub minar, we can find historical heritage. Qutub Minar is often visited by visitors who are curious about this historical heritage, with some beauty in it so many people want to visit this place. Red Fort is the third tourist place that can be visited when you come to New Delhi, India. Red Fort or Red Fort is also one of the historical buildings in New Delhi, India, which was built in 1638 by the Mughal emperor Sultan Shah Jahan. The fort was built as a residence of the royal family and is also one of the UNESCO World Heritage Sites. Even so, this red fort was a silent witness to the end of the Mughal Dynasty in India. Even though the Mughal Dynasty had been in power for three centuries. This fort is called the Red Fort because it has a giant wall with bermaterialkan red sandstone that covers the eight sides. The wall extends from the end of Shah Janabad city with an overall length of 2.5 km and a height that varies between 16 to 33 meters. 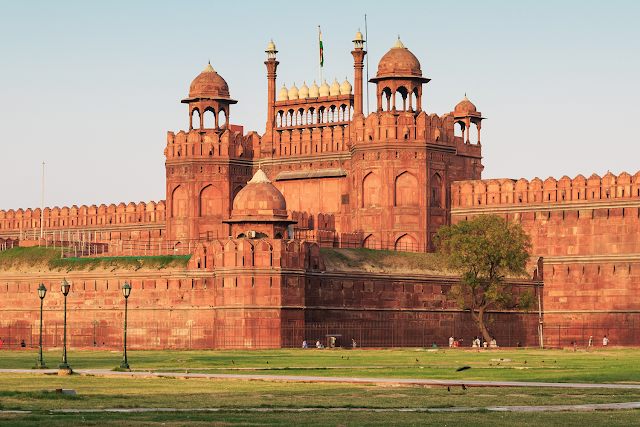 This red fortress is also a symbol of the architectural brilliance and power of the Mughal Dynasty. This building shows the results of high-level works of art inherited from the Mughal sultanate. This work of art, which is a blend of synthesis from Persian, European and Indian art, is expected to amaze you when you visit New Delhi, India. The architectural style which is a combination of the three works of art by Mughal royal artists at the time was made into a unique new architectural style, rich in form, expression and color. This style of fusion is known as Shah Jahani's style. The tour to the fort seems to be more complete with two main gates, namely Lahore Gate and Delhi Gate. As soon as visitors enter the Lahore Gate, which is the main gate, Mina Bzaar, known as Chatta Chowk, is a small, all-round market. Then there is also the Naubat Khana, the music room which has four floors.